This issue of Otolaryngologic Clinics, guest edited by Drs. Teresa M. O, Nate Jowett and Tessa Hadlock, is devoted to Facial Nerve Paralysis: Causes, Prevention, Reanimation, and Rehabilitation. 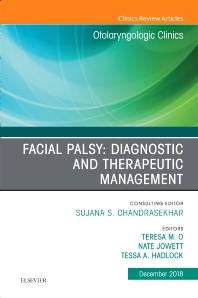 Articles in this outstanding issue include: The Importance and Psychology of Facial Expression; General Approach to Facial Palsy; Outcomes Tracking in Facial Palsy; Medical Management of Acute Facial Palsy; Surgical Management of Acute Facial Palsy; Management of Flaccid Facial Paralysis for Less than Two Years; Management of Long-Standing Flaccid Facial Palsy: Periocular Considerations; Management of Long-Standing Flaccid Facial Palsy: Midface/Smile - locoregional muscle transfer; Management of Long-Standing Flaccid Facial Palsy: Midface /Smile and Static Sling; Management of Long-Standing Flaccid Facial Palsy: Brow, Midface, and Lower Lip; Medical Management of Post-Paralysis Facial Palsy/Synkinesis; Surgical Management of Post-Paralysis Facial Palsy/Synkinesis; Management of Facial Nerve Schwannoma; Management of Vestibular Schwannoma: Otologic and Facial Nerve Considerations; and Management of Bilateral Facial Palsy. CME is also available for Otolaryngologic Clinics of North America.